February 10, 2018 February 17, 2018 - by stuffineverknew - 1983 Comments. February 3, 2018 February 17, 2018 - by stuffineverknew - 72 Comments. January 28, 2018 February 17, 2018 - by stuffineverknew - 14 Comments. 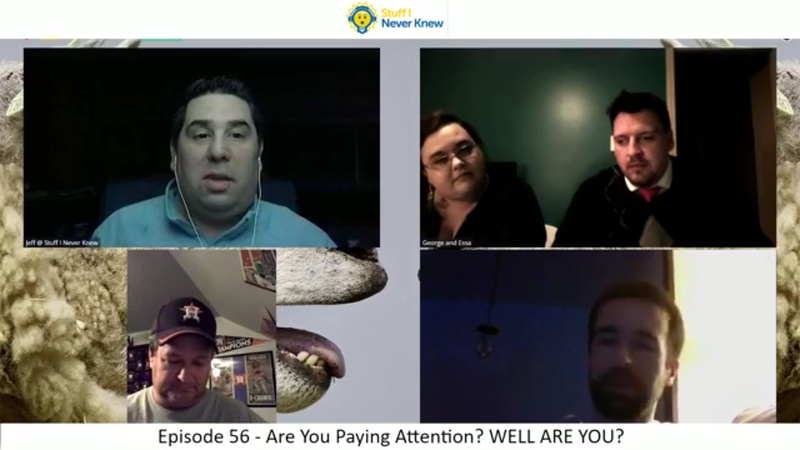 Are you Paying Attention 2 – Episode 56 – WELL ARE YA!?!?! January 20, 2018 February 17, 2018 - by stuffineverknew - 294 Comments. January 14, 2018 February 17, 2018 - by stuffineverknew - 17 Comments. January 8, 2018 February 17, 2018 - by stuffineverknew - 197 Comments. December 29, 2017 February 17, 2018 - by stuffineverknew - 31 Comments. October 22, 2017 February 17, 2018 - by stuffineverknew - 2278 Comments. Hey Shorty, We’re Gonna Party Like it is Episode 50! August 12, 2017 February 17, 2018 - by stuffineverknew - 10 Comments.